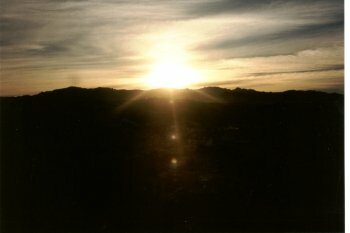 Today I’m just sharing a photo with you that I took in front of “La Ricoletta” as the sun set over Sucre. The BBC News website has some interesting pictures of the floods in Bolivia. 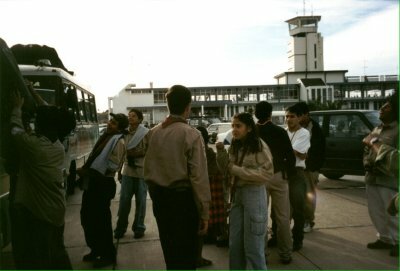 The airport in Sucre (SRE) is located outside the city. It is not equipped for international flights and only has a basic terminal building and runway. The runway can only be used in the daytime as there are no landing lights. I travelled there from Santa Cruz in a Boeing 727 from Lloyd Aero Boliviano (LAB). The picture shows the airport looking back from the car park. Our luggage was just being loaded onto the buses at this particular moment. LAB are currently not flying to Sucre because of operating difficulties. I have heard stories about cars, in particular taxis, being driven to the airport and parked either side of the runway to allow emergency landing of aeroplanes after dark. If Sucre is to become the seat of Government then surely the airport will need to be upgraded to international standards. This was my first impression of Sucre when I visited in 2000. It was taken at the airport just after attempting to collect my baggage (which wasn’t on the flight and arrived a day later). In the foreground, somewhat dark, are a brass band welcoming us to the town. In the background a taxi can be seen, although we used mini-buses to get into town from the airport. 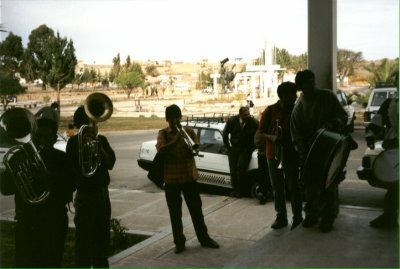 Being greeted at the airport by a band as we stepped of the plane made us feel really special. I remember commenting that this would hardly be possible in Frankfurt except for diplomatic dignatories – and that was pre 9/11!